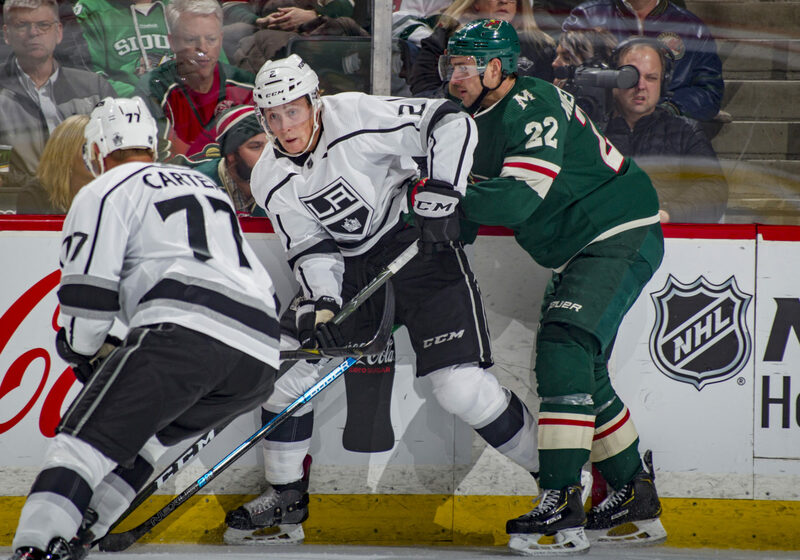 –The Kings made a pair of roster moves Wednesday morning, assigning Austin Wagner and Sean Walker to AHL-Ontario. These moves are largely influenced on lineup needs for upcoming games within the parameters of the salary cap. In other words, when both the Kings and Reign are in town, practicing under the same roof, Los Angeles has the flexibility to make recalls and assignments based on the lineup they’d like to use against their next opponent, as long as the player they’d like to recall fits under the cap. “I think we have two young players that we’re fond of there, and the fact that we’re so close now, I think there could be a lot of movement back-and-forth that could be helpful to the player and the team,” John Stevens said after practice. Expect a roster move to be announced at 10:00 a.m. Thursday morning. –Paul LaDue left practice early and was followed into the Kings’ team area by Assistant Athletic Trainer Miles Hirayama, which caught our eye. Stevens hadn’t yet received an update on LaDue at the time he met with the media. “Never good that he doesn’t finish practice, but I don’t think it’s anything that major, just something where we’re going to have to talk to the trainers and see exactly where he’s at,” he said. “I still think he could be a possibility to be healthy for tomorrow, it’s just something that didn’t allow him to continue.” Even after Walker’s assignment, the Kings have seven active defensemen and would not need to make a roster move if LaDue is unavailable Thursday. Vilardi’s silky-smooth hands make up a part of a highly skilled package. We’ve spoken about how some players might need a few days or games to regain their reads, or their legs, but what about hands? –Anze Kopitar was pithy and direct when asked about an area the Kings could build on from Sunday’s win. “Special teams,” was his answer. He was also asked about Dustin Brown’s return to being a net-front menace on the power play and referred to the first of Los Angeles’ two bang-bang power play goals, which started with Henrik Lundqvist stopping his snapper from the right side. The Los Angeles Kings, in conjunction with FOX Sports West, this week will launch ‘Hockey Night in Los Angeles,’ a series of special weekend games in which the club’s broadcasts and activations in and around STAPLES Center will look and feel different, including celebrity guests, debate-themed programming and outdoor fan fests featuring live music acts. -A celebrity “Guest of Honor” featured on the broadcast each night including Eric Stonestreet this Saturday. -“LA Kings Live” pregame show to welcome former Kings forward Derek Armstrong alongside Patrick O’Neal and Jarret Stoll for a debate panel discussing Kings and NHL storylines. -New video series hosted by former Kings forward Teddy Purcell. -Kings Broadcasters participating in a “Survivor Pool” as part of each broadcast. -Special video features focused on Youth Hockey in Southern California during most broadcasts. This Saturday actor Eric Stonestreet will be the featured celebrity guest. Stonestreet is the co-star of ABC’s Modern Family. For the November 10 game, Kevin Ryder – the co-host of KROQ’s popular Kevin & Bean morning radio program – will be the celebrity guest. -Outdoor pregame fan fests prior to most evening games featuring a variety of live music acts. -New in-arena Saturday Night Opening video for most of the games. -Anthem performances by, among others, Mike Yung (Nov. 3); Daniel Emmett (Nov. 10); and multiple appearances by Pia Toscano.